Sidney’s Ratez Roberts comes down with a rebound while covered by Tippecanoe’s Nolan Mader during a Greater Western Ohio Conference American North Division game on Tuesday in Sidney. Roberts scored 12 points. 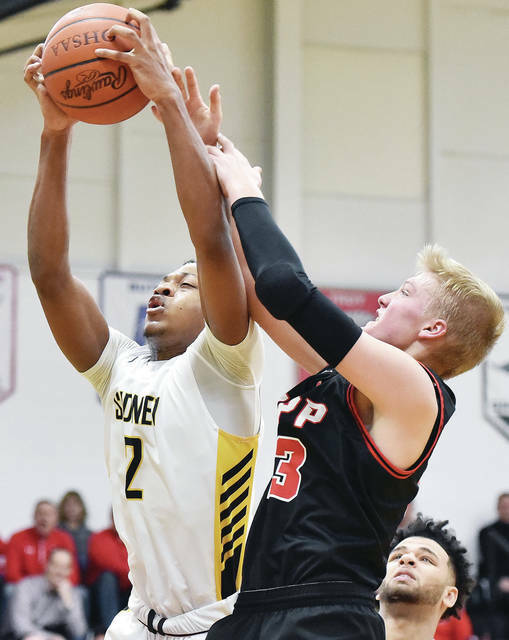 Sidney’s Andre Gordon comes to a quick stop while covered by Tippecanoe’s Griffin Caldwell during a Greater Western Ohio Conference American North Division game on Tuesday in Sidney. Gordon led the Yellow Jackets with 28 points. Sidney's Andre Gordon drives against Tipp's Griffin Caldwell during a Greater Western Ohio Conference American North Division game on Tuesday in Sidney. Sidney's Keith Lee shoots during a Greater Western Ohio Conference American North Division game against Tippecanoe on Tuesday in Sidney. Sidney's Trey Werntz and Tippecanoe's Patrick Manes go for a loose ball during a Greater Western Ohio Conference American North Division game on Tuesday in Sidney. Sidney's Andre Gordon shoots as Tipp's Griffin Caldwell defends at Sidney Tuesday. Sidney's Andre Gordon shoots as Tipp's Zach Frederick defends at Sidney Tuesday. Sidney's Ratez Roberts shoots over Tipp's Nolan Mader at Sidney Tuesday. Sidney’s Darren Taborn drives as Tippecanoe’s Nick Robbins defends during a Greater Western Ohio Conference American North Division game on Tuesday in Sidney. 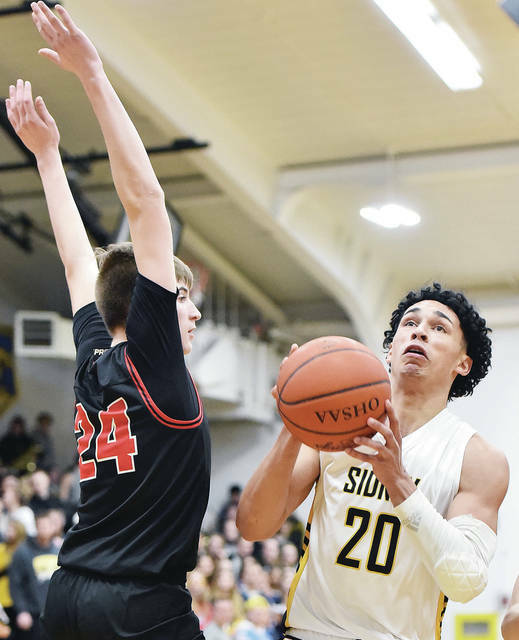 SIDNEY — Sidney senior guard Andre Gordon lights up social media practically every time the Yellow Jackets take the court. 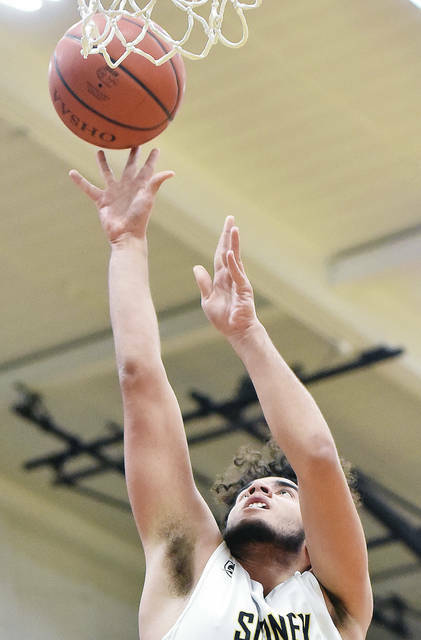 His high-flying dunks — which usually include a 360-degree spin, under the legs move or something else athletic — get circulated on Twitter throughout the Ohio basketball scene more than Tweets from the President get circulated throughout the national political scene. And when it’s not Gordon, Sidney senior forward Ratez Roberts has had a few viral slams, too. Sidney senior Josiah Hudgins doesn’t get in on that action much. Hudgins, a 6-foot-0 guard, doesn’t get too many breakaway chances. When he does, he usually opts for laying it off the glass. Hudgins doesn’t have to worry about it because he’s found other ways to score, including late from the free-throw line on Tuesday. 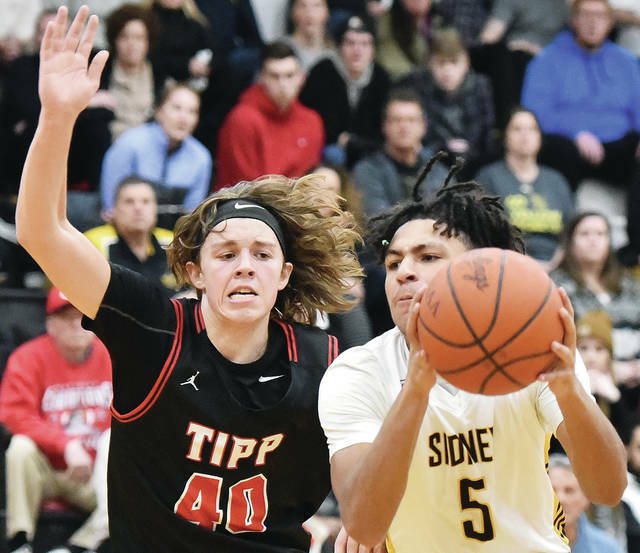 Hudgins scored 17 points to help Sidney earn a 62-48 victory over Tippecanoe in a Greater Western Ohio Conference American North Division game. The victory improves Sidney to 13-3 overall and keeps the squad tied with Vandalia-Butler atop the North with a 9-2 record. Gordon, a Virginia Tech commit, led Sidney with 28 points and put another a dunk-a-thon for the second consecutive night by slamming four. Roberts scored 12 points, including two dunks. His last was a one-handed breakaway slam with under two minutes to play that essentially iced the win by putting Sidney ahead 54-43. Hudgins’ points were equally crucial. He scored nine in the fourth quarter and made 7-of-8 foul shots. He hit two of his patented bank-shot 3-pointers in the first quarter to help the Yellow Jackets take an early lead. “I’ve been working on my free throws a lot lately, so it’s nice to go out there and hit them. Work’s paying off,” Hudgins said. Hudgins averages a little over eight points per game and has scored in double figures four times this season. He’s been shooting hot as of late and has hit or surpassed his average in five of the last eight games. Tippecanoe (5-10, 3-7) finished the first half on a 12-4 run to tie it 26-26 at halftime. After Gordon made a basket with 4:54 left in the third to put Sidney ahead 32-31, Tipp rattled off the next six points to take a five-point lead. The Yellow Jackets took control after that, though. 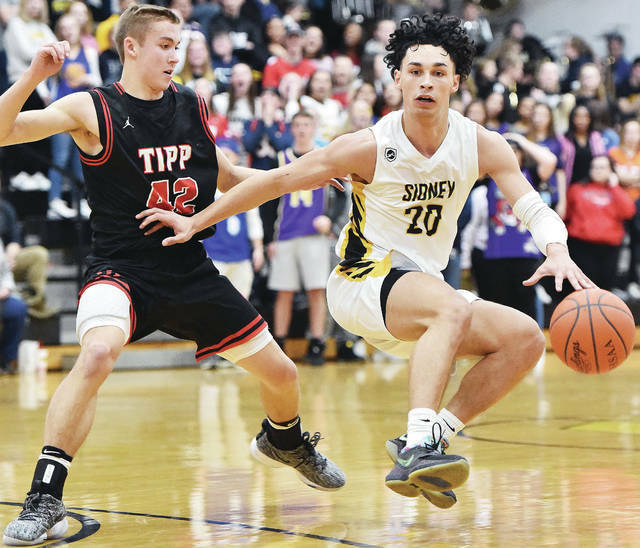 Gordon drove along the left baseline and slammed a thunderous two-handed dunk with 1:51 left and scored on a jumper 40 seconds later to bring Sidney within 38-37. He then had a steal and passed off to Hudgins, who made a basket with 1.6 seconds left to give Sidney a 38-37 lead. The Yellow Jackets opened the fourth with a 10-2 run to take a 48-39 lead with 4:52 left. The Red Devils didn’t come closer than seven points after that. 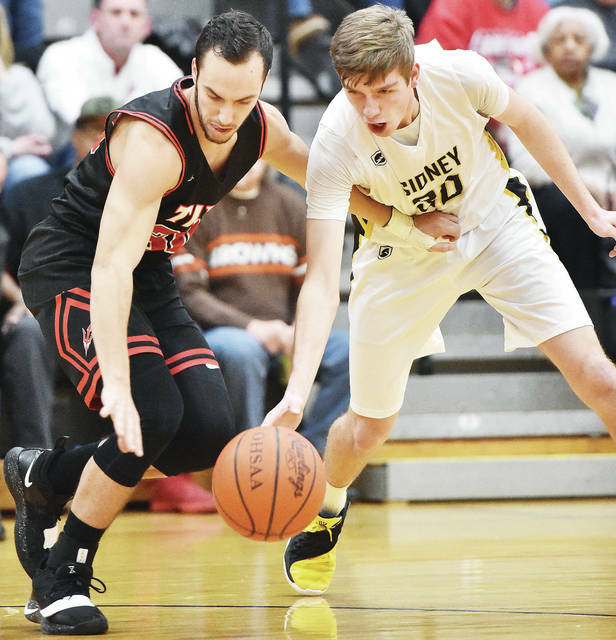 Willoughby was happy the team was able to pull away late after letting leads shrink or slip away in recent games — including a 63-61 loss at Fairborn on Jan. 18 in which the Yellow Jackets blew a 10-point lead in the fourth quarter. Sidney jumped ahead early. 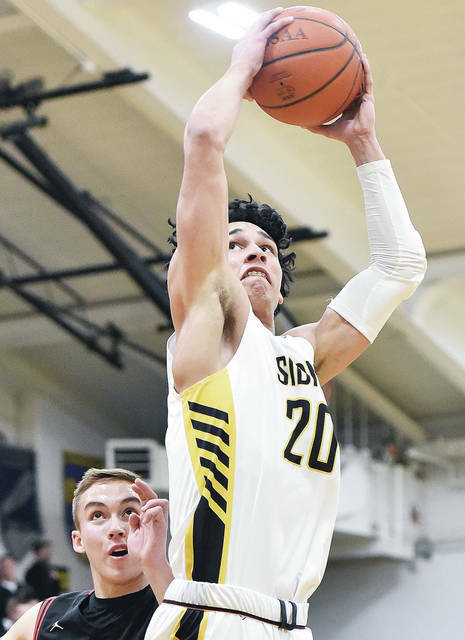 After the teams traded baskets in a lively first two-and-a-half minutes that saw Sidney ahead 10-9, the Yellow Jackets finished the quarter on 9-5 run to take a 19-14 lead. The last points of the quarter came on a 3 by Gordon, which gave him the school’s career record for made 3s. Gordon made another 3 to open the second, which gave Sidney a 22-14 lead. The Yellow Jackets’ shooting went cold against Tippecanoe’s zone the rest of the half, though, and things tightened. The Red Devils scored eight straight points to tie it 24-24 with 3:56 left, then both squads didn’t manage a basket until the final minute. Sidney will continue GWOC American North play on Friday when it hosts Troy. The Trojans entered a road GWOC North game at Greenville on Tuesday with a 5-10 overall record and 4-6 divisional record. The Yellow Jackets beat Troy 67-48 on Dec. 7 in the teams’ first conference matchup. Friday’s game will be Sidney’s third in five days. Gordon became the school’s all-time 3-point leader on Tuesday and surpassed 500 career assists. Gordon’s 3 late in the first gave him 133 for his career, which is a new school record. He has 134 total 3s after Tuesday’s win. Gordon needed five assists entering Tuesday’s game and picked up his fifth midway through the fourth to reach 500. He became the school’s career assists leader last season. 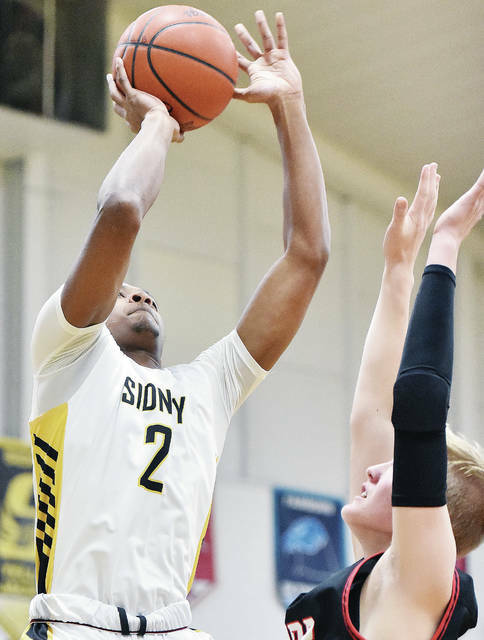 Correction: The article on Sidney’s win over Wapakoneta from Monday incorrectly stated Sidney senior Ratez Roberts holds the school record for rebounds. DeWayne McCluskey, a 1988 graduate, holds the school’s career rebounding record with 646. Roberts surpassed 500 career rebounds in Monday’s game and currently ranks fifth in school history. Sidney’s Andre Gordon drives against Tipp’s Griffin Caldwell during a Greater Western Ohio Conference American North Division game on Tuesday in Sidney. Sidney’s Keith Lee shoots during a Greater Western Ohio Conference American North Division game against Tippecanoe on Tuesday in Sidney. Sidney’s Trey Werntz and Tippecanoe’s Patrick Manes go for a loose ball during a Greater Western Ohio Conference American North Division game on Tuesday in Sidney. Sidney’s Andre Gordon shoots as Tipp’s Griffin Caldwell defends at Sidney Tuesday. Sidney’s Andre Gordon shoots as Tipp’s Zach Frederick defends at Sidney Tuesday. Sidney’s Ratez Roberts shoots over Tipp’s Nolan Mader at Sidney Tuesday. 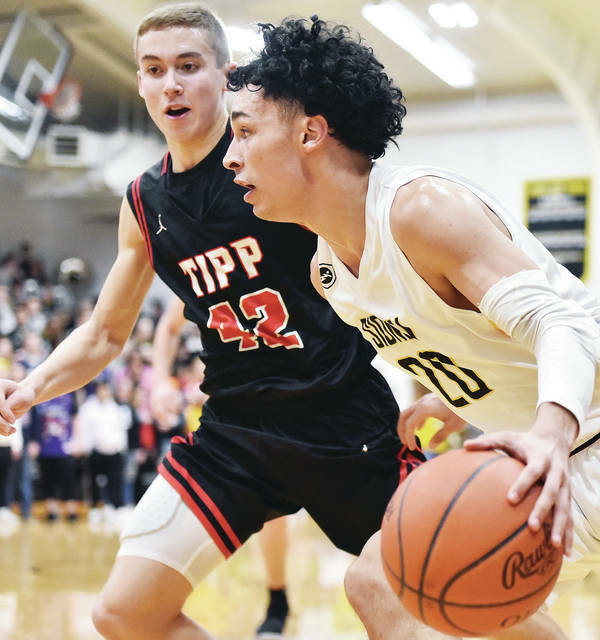 This entry was tagged American North Division, Andre Gordon, basketball, boys, boys basketball, Darren Taborn, GWOC, GWOC North, high school, hoops, John Willoughby, Josiah Hudgins, North, Ratez Roberts, Sidney, Tippecanoe, Yellow Jackets. Bookmark the permalink.